This page features the ever popular single-goal and multi-goal tilt-mazes. Try the single-goal mazes first, and then tackle the multi-goal mazes. Capturing all those blue-targets is not as easy as it looks. A red ball sits in a flat tray containing one or more blue squares (goals). The challenge is to guide the ball around the tray and collect all the blue squares. Tilt the tray to, literally, start the ball rolling. The ball rolls in a straight line until it hits a wall, you can then tilt again. Click Restart to load first maze or reload current maze. Click Previous/Next to switch between mazes. Use the cursor keys to tilt. 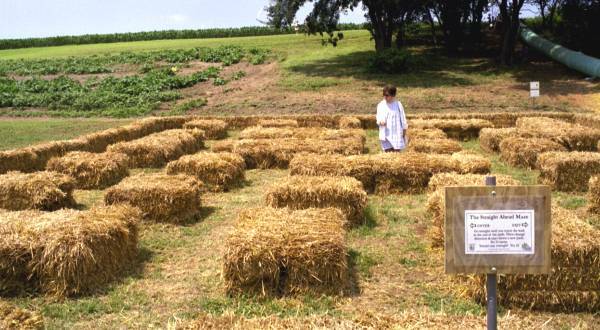 Here is a photo of a tilt-maze implemented as a walk-round maze (Cherry-Crest Farm, near Lancaster, Pennsylvania, USA - Summer 2001). Photo provided by Robert Abbott. 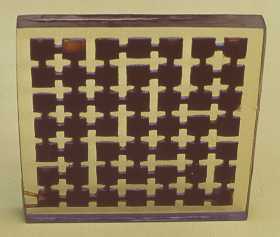 The photo on the right shows a mechanical implementation of a 2D tilt maze made by M. Oskar van Deventer. The maze is made of transparent material and filled with very black coffee. The 'runner' is an air-bubble in the coffee that moves through the maze when you rotate it. The object is to get the air-bubble in the centre, while keeping the Coffee Maze vertical. 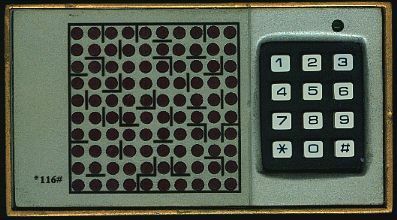 The photo on the left shows a top down view of the tilt maze console developed by my partner Bill Mitchell. It utilises mercury switches to detect tilt and supports a wide variety of configurable puzzles. Read more about it on its own page. Tilt mazes were featured in the September 2003 issue of the US magazine Discover.